Buy X amount and get Y FREE. This applies to mushroom / spore related products only. This special will be automatically deducted at checkout. No coupon code required. You must add the free items to your cart to get the discount. This is our most common special and it applies ONLY to mushroom spore related products. This will not apply to Hangover Prevention Pills or anything in the Microscope category. Buy 5 or More: Add 5 or more mushroom/spore related products to your cart and enjoy a 20% discount. This equates to buy 4 get 1 free. Please DO NOT use the notes box to add free /discounted items. You must add them to the cart if you want the discounted items. We will not ship them unless you add them. The cart will automatically calculate the discount if you add the items. UPDATE 1-31-19: We are adding a free Arenal Volcano Cubensis Spore Syringe to this special of buy 5 or more. You have to add the Arenal Volcano Cubensis Spore Syringes to your cart, along with 5 other spore syringes or prints. Apply the coupon code volcano which will discount $16.95. You can apply the coupon code under VIEW CART > USE COUPON CODE. 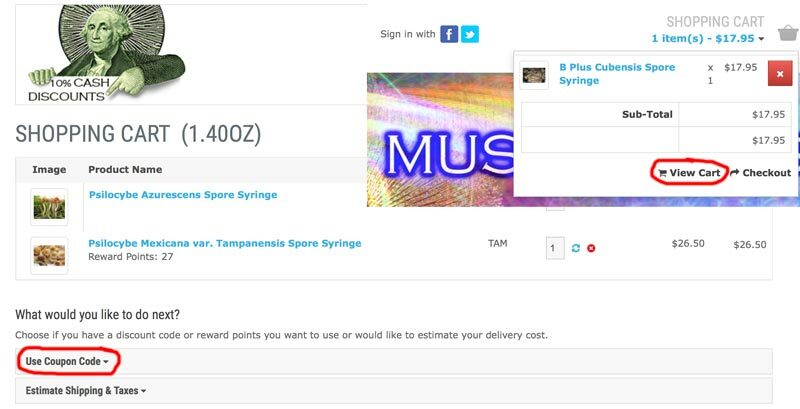 You will be getting 6 spore syringes for the price of 4 which is about 33%+ off. You may also combine this special with our mail in cash discount of 15% off to give you a 48% discount! Spores can last for years! Stock up and save money! We do offer a 60 day viable guarantee on spore prints and spore syringes. For long term storage it’s best if stored in the refrigerator. Spore prints need to be sealed from moisture before storing in the fridge. Spore prints have been known to last 18 years but that is not the norm. Liquid culture syringes should be used within 3 months of receiving them. Liquid culture syringes absolutely should be stored in the refrigerator unless they will be used soon. We do offer a 60 day gurantee on the liquid culture syringes. There is currently a 15% discount for mail orders paid by cash. Details are given at check out when you select the 15% discount mail order by cash payment option. If you have one our coupon codes from our social media accounts, you apply that under VIEW CART > USE COUPON CODE. If the coupon code is specifically for certain mushroom product, you must add that product to your cart for it to be discounted. The discount will not be applied to your order if you input this in the notes box and we will not go back and rebill charges and credit it. Use it correctly or lose it. The notes box should only be used to include a 2nd choice in case we run out of stock on your item.